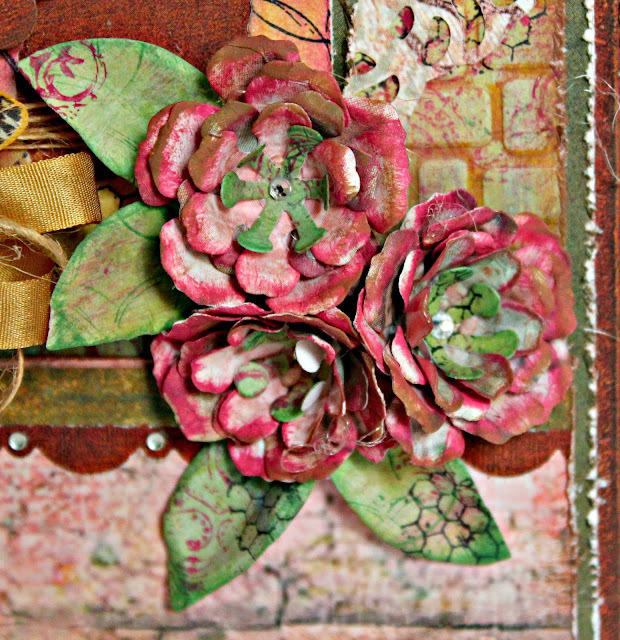 Are you ready to get your mixed media on today!!! What better way but to create but by using Eileen's Stacking Drawer Die and Treasure Box Die!!! I KNOW THEY ARE NEW!!! Die cut the Treasure Box Die from Little Sizzles Matboard. Paint pieces with black paint. Cut long edges of lid from Treasure Box Die; insert inside of Treasure Box. Die cut Stacking Drawer from Little Sizzles Matboard . Paint pieces with black paint; form boxes. 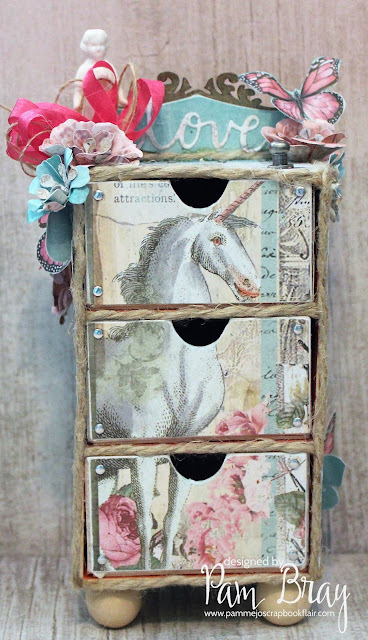 Glue boxes inside of prepared Treasure Box; hold in place with paper clips to create Mixed Media Stackable Drawers!. Emboss aluminum tape; add to front to drawers. Ink over emboss tape with alcohol inks. Add small pieces of pattern paper to inside of drawer pulls. Die cut Cantilever legs from Little Sizzles Matboard . Add embossed aluminum tape to legs; ink with alcohol ink. Emboss aluminum fold to Little Sizzles Matboard; die cut gears. Adhere pattern paper behind gears. 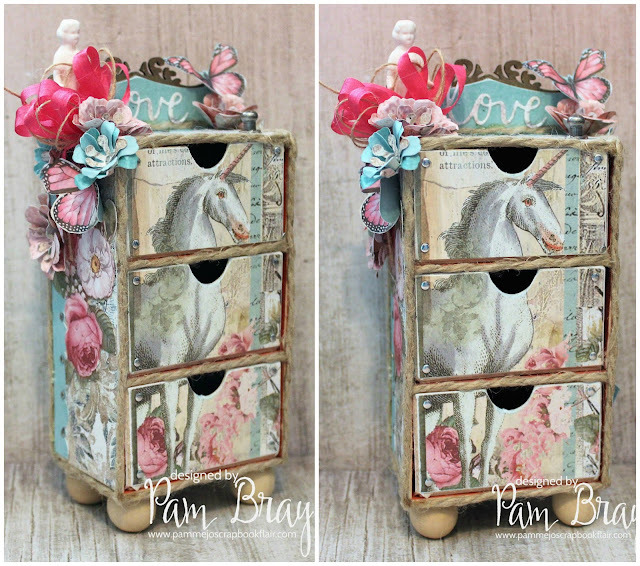 Adhere to sides of Mixed Media Stackable Drawers. Alcohol ink metals; adhere to top of Mixed Media Stackable Drawers. Adhere larger prepared gears, metals to back of Mixed Media Stackable Drawers. 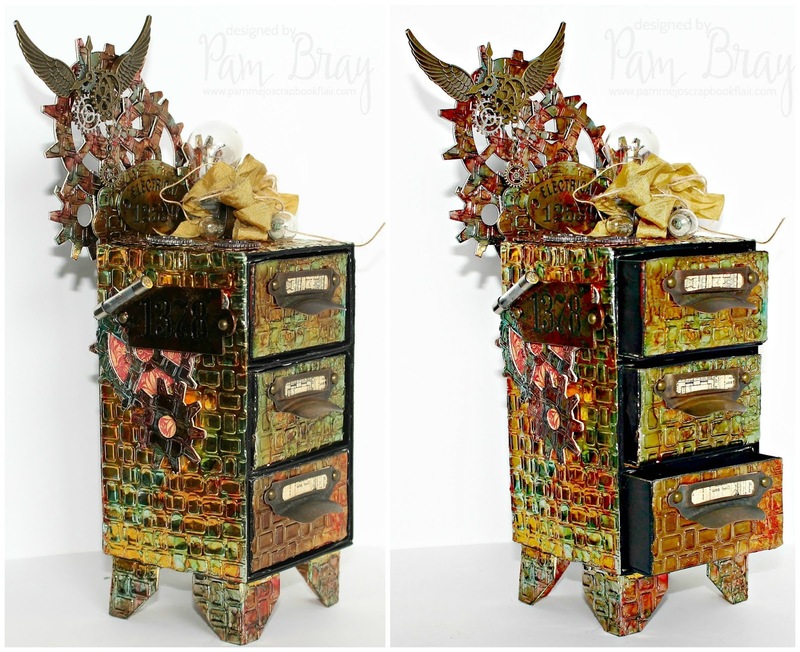 Add metal gears to top of Mixed Media Stackable Drawers. 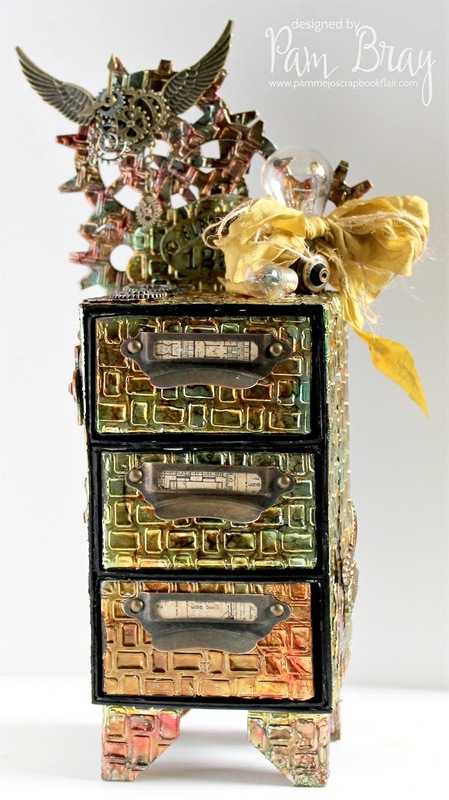 Add twine and gold ribbon along electrical pieces to top of Mixed Media Stackable Drawer. 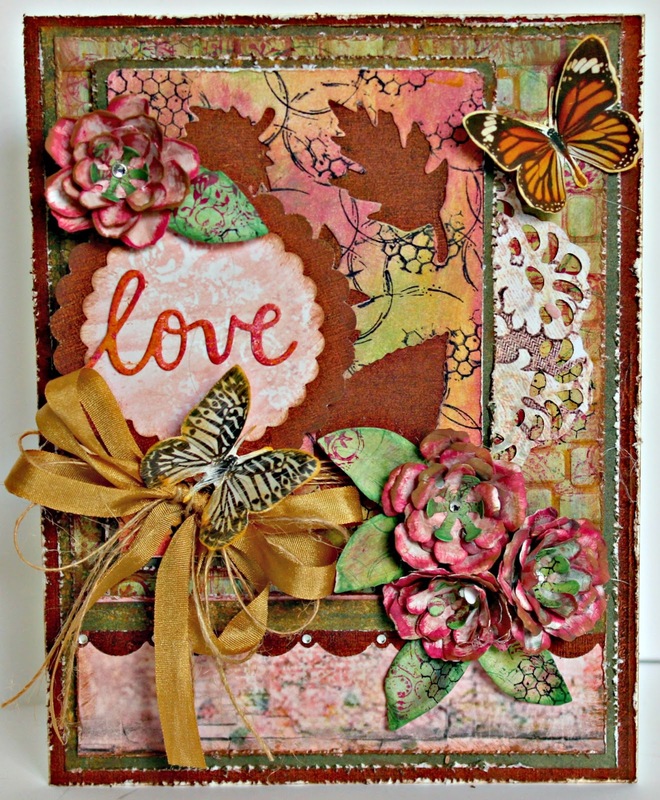 I hope you are inspired to stop by Eileen's Blog and see a few more projects from the Inspiration Team. .What better way but to celebrate but to head over to PageMaps and check out all the fabulous Card Sketches! They will definitely get your creative mojo going!!! 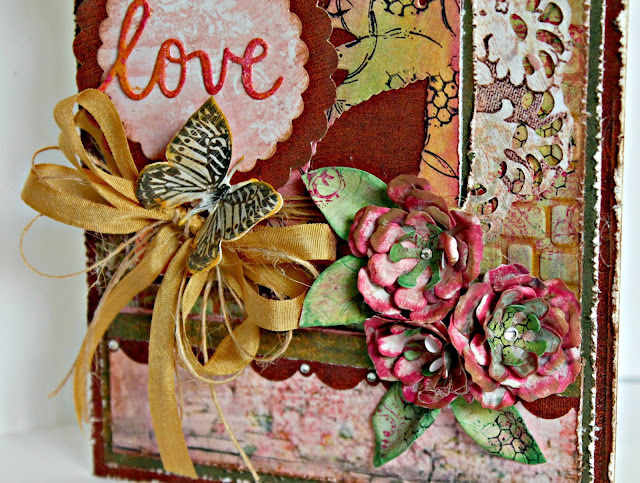 Start your card by adhering layers of Graphic 45 Amour pattern papers to card front. 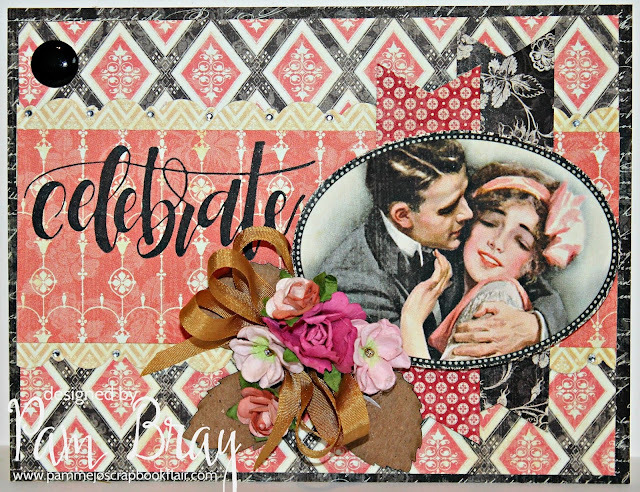 Stamp "Celebrate" image to front with black ink. Add small flags and Epherema image to front of card with pop dots. Adhere small leaves, flowers and bow to front of card. Today I am sharing a fun and easy It's A Boy Folio! I am sure sometime this year you will be having a new baby arriving in your life and if not well the folio is a great blue print to recreate with any of Authentique fabulous collections! Authentique has both a Swaddle Boy and a Girl Collection so we have you covered on creating your own unique folios! Begin by scoring a piece of 8" x 10 1/4" grey card stock at the 5" and 5 1/4" score lines. Cut two pieces of pattern paper to measure 5" x 8" and one 1/4" by 8"; adhere to front of folio. Cut a piece of grey card stock to measure 6" x 7 1/2"; score 4 3/4" and 5" marks. Adhere inside flap to folio. Adhere Swaddle Boy pattern paper and border strips to inside pages. Cut a piece of grey card stock to measure 4 3/4" x 3 1/2". 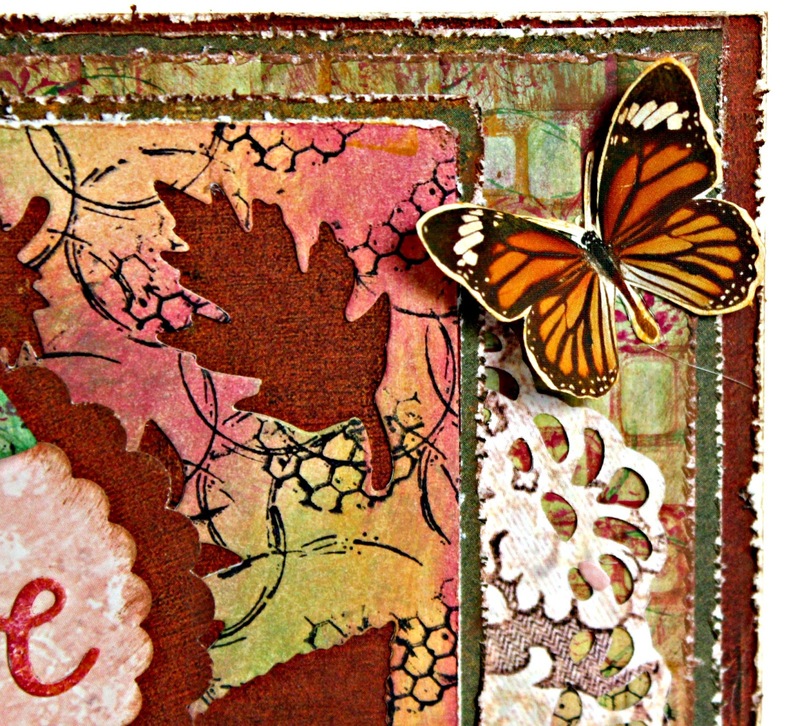 Adhere pattern paper and border strips to front of card stock. Add Swaddle Boy Element die cut to front of pocket with pop dots. Add decorated pocket to Inside Flap with pop dots. 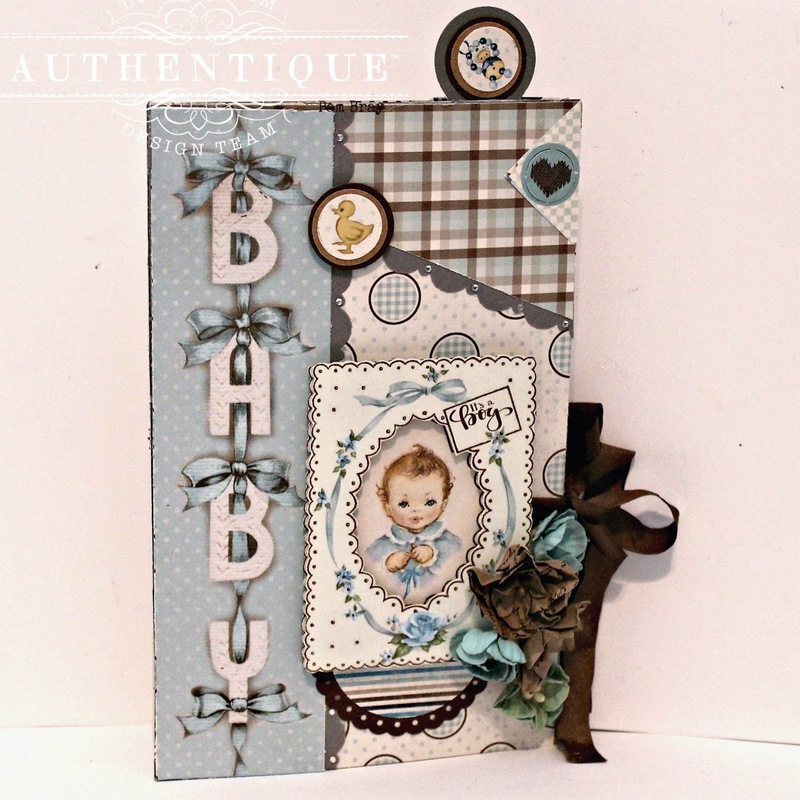 Create two tags using Swaddle Boy pattern paper, Swaddle Boy Elements die cuts, scallop borders, gemstones and ribbons. Add to pocket. Cut 2" x 3", 3 1/2" x 3", 5" x 3" and 6 3/4" x 3" grey card stock; corner punch pieces at bottom. Cut Swaddle Boy pattern paper; corner punch bottom of each piece. Adhere to grey card stock. Layer together at top; Adhere to center panel of folio. Decorate with Swaddle Boy Elements die cuts. Cut grey card stock to measure 5" x 8"; cut at angle to measure 1 1/2" at top to 5" at bottom. Adhere Swaddle Boy pattern paper, scallop strip and borders to top of Flap Pocket Insert. Adhere Flap Pocket Insert to top of inside folio page at the top, bottom and left side. (Leave flap open). Add Swaddle Boy Elements Die Cuts to inside of Flap Pocket Insert. Fussy cut small feet heart from Swaddle Boy Element die; add to Flap Pocket Insert with pop dots. Add gemstones. Scallop border punch grey card stock. Adhere "I Love You" Swaddle Boy Elements die cut to prepared grey card stock. Adhere to bottom of Back Inside Flap. Cut 2 pieces of 4" x 8" grey card stock; fold in half. Hole punch on fold. Tie together with ribbon. Adhere Swaddle Boy Element die cut to front. Adhere Swaddle Boy pattern paper to each page for photos or journaling. Create planner clip by punching progressive size circles and image from pattern paper; adhere together on large paper clip. Add to front of small book to hold close. Cover with Swaddle Boy pattern paper; borders, and die cut. 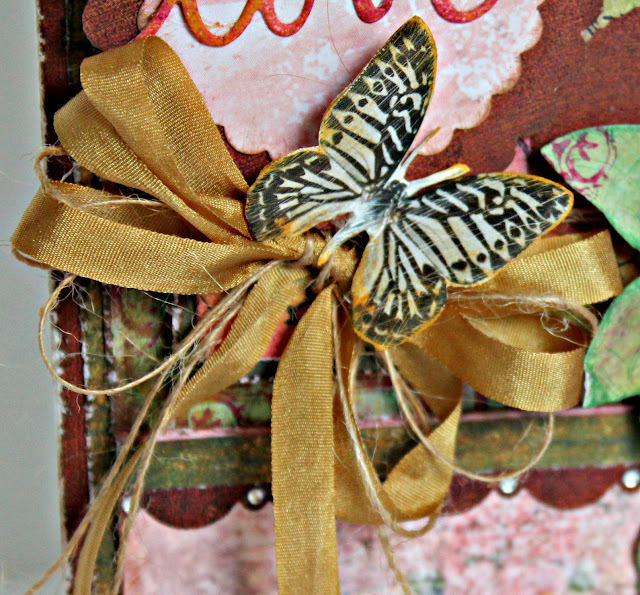 Add ribbon to front and back folio covers. Tie. Fussy cut two Swaddle Boy Elements die cuts; layer together. Add to front to cover with pop dots. Finish with small Swaddle Boy Elements and gemstones. 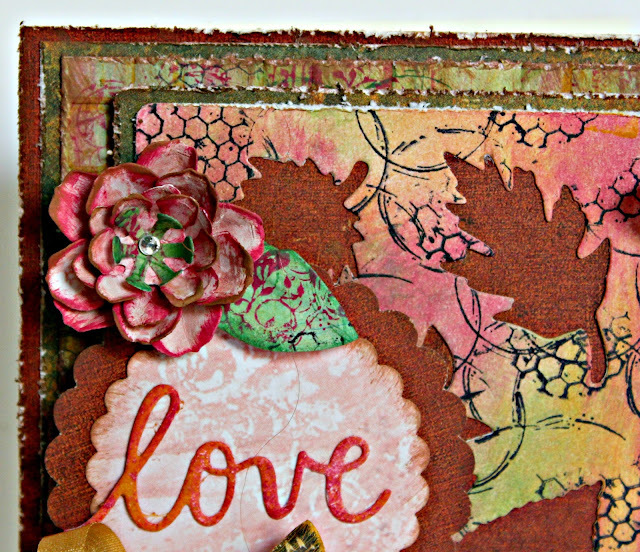 Circle Punches: 1 1/4" , 3/4", 7/8"
Full reveal of Eileen's fabulous new releases! Last week I shared a few sneak peeks! Today though I will be sharing Eileen's XL Stacking Drawer Die! I used Stamperia Wonderland Collection to create my "Wonderland of Love" Drawer Set. Begin by die cutting the XL Stacking Drawer Die from Little Sizzles Matboard. Adhere pattern paper to the front of each drawer. Adhere the outside part of the drawers together. Adhere a piece of matboard that is cut the width of the outside of stacked drawers. Adhere chipboard label to back of prepared stacked drawers. Add small wood ball beads under prepared stacked drawers. Adhere tan jute around all edges of project. Fussy cut some of the pattern paper; adhere to side of drawer. Form flowers; adhere to side of drawers. Cover small label with pattern paper; adhere to chipboard label. 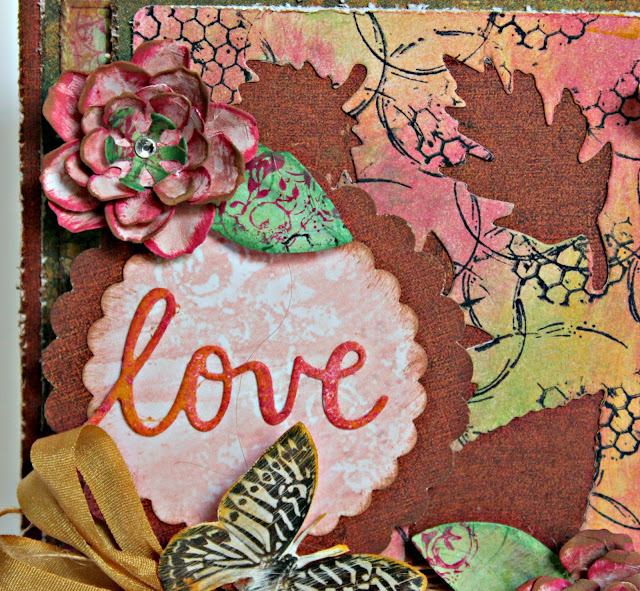 Die cut "Love" word form Journaling Words 5pc Die Set. Fussy cut small butterfly; adhere to prepared stacked drawers. Adhere small resin doll and knob to top of stacked drawers.